Capitalism is the end of the world? Kingston Art School, Kingston University, London. Guerilla Comms, Self Organisation and Meme Wars workshop at Byline Festival with Bernardo Gutiérrez. Featured in an article on ‘Memes as a future design form’, in Disengo Journal 18. Beyond Words, Photomontage Workshop at the Design Museum, London. Part of the Hope To Nope exhibition programme. Dialogues Forum for PHD/MA/BA Fine Art students, invited speaker alongside artists DashDem and curator Clare Carolin, Norwich University of the Arts, Norwich. Art Into Life panel discussion with Kate Schwarb, Ben Highmore, Judith Stewart, Sainsbury Centre Studio, UEA, Norwich. Austerity WTF!, School of Art and Design, Liverpool John Moores University, Liverpool. Gregory Sholette: Delirium and Resistance: Activist Art and the Crisis of Capitalism Book Launch. Symposium and conversation. Kim Charnley (video), Noor Afshan Mirza, Loraine Leeson and Noel Douglas. Styling Revolt or Revolt in Style? Paper presented at Ideas of Revolt, Graphic Design Educators Network Conference, Sheffield Institute of the Arts, Sheffield. The Future Of Social Mobilisation In The Creative Industries. Panel discussion at Hype Peace Pop Up Store, Shoreditch, London. Discussion organised by Crowd Talks, Peckham Pelican, London. Alternative Art School, School of Design, Kingston University. Power, part of The Expanded Designer Talks, UAL, Camberwell College of Art/Chelsea School of Art and Design. Propagate+Occupy Design Refugee Crisis themed workshop, Athens, Greece. Talk at Boom Festival, Portugal. Work featured in Viewpoint Magazine. Beautiful Trouble School of Art and Design, Kingston University, London. Political posters of the Occupy protest wave Nottingham Museum and Castle Gallery, as part of ‘A World To Win’ V&A Exhibition, Nottingham. Regime Change Begins At Home Cards Featured in Visual Impact: Creative Dissent in the 21st Century by Liz mcQuiston published by Phaidon ISBN: 0714869708. The Graphic Language of the Anti-Austerity Movements since 2008, PLANK conference, Techniques of Art and Protest, Kings College, London. Talking as Occupy Design. Resist, Revolt, Design Pick Me Up Graphic Arts Fair, Somerset House, London. Beautiful Trouble Winchester School of Art, Winchester. Cultural Exchange Article for Grafik magazine. Pefkios Georghiades Hall, Cyprus University of Technology, Limassol, Cyprus. Disobedient Objects, Part 1. Protest Design, talk as part of Disobedient Objects Exhibition and The London Design Festival, V&A Museum, London. Featured in Disobedient Objects book, Catherine Flood and Gavin Grindon,V&A Publishing. Sign Struggles talk at ‘It’s Not Nice That’ Exhibition, Lighthouse Gallery, Glasgow, Scotland. Occupy Design talk and workshop. Camberwell College of Arts, University of Arts, London. Signs Of Revolt, Norwich University Of The Arts, Norwich. Signs Of Revolt, talk at London College Of Communication, University of Arts, London. Beautiful Trouble, talk at Buck New University, High Wycombe. Otvaranje izložbe “To je politička ekonomija, tupane” pratiće razgovor o politici vizuelne reprezentacije krize i protesta, uz učešće umetnika Noela Douglasa iz Londona i Grupe Škart i Udruženja Kurs iz Beograda, te Borisa Kanzleitera i beogradskog umetnika i aktiviste Vladana Jeremića kao moderatora. 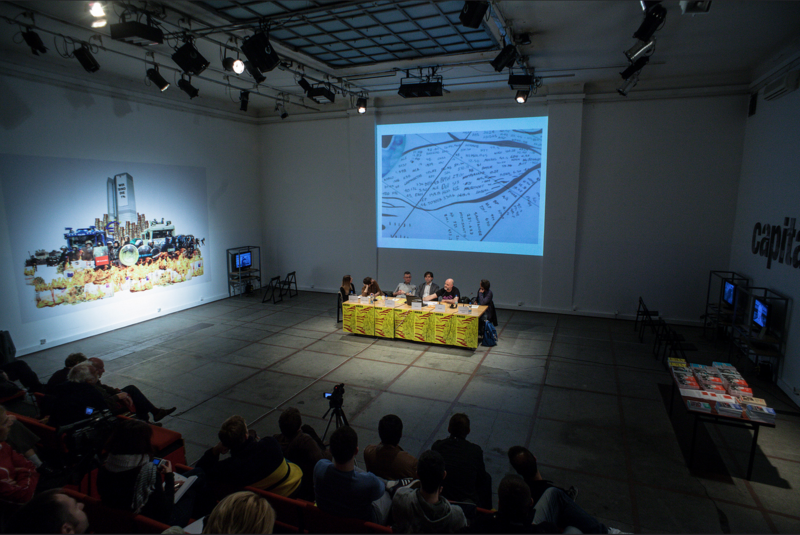 Panel talk about my practice as part of Krisis and Alternatives at The Centre For Cultural Decontamination, Belgrade, Serbia. Press article here. Part of panel discussion at Radical Gestures: designing protest, resistance and refusal, Central Saint Martins College of Arts and Design, University of the Arts London. I Am, Because We Are, talk at Glasgow School of Art, Glasgow, Scotland. Design Activism: how does it change things? Design Culture Salon, V&A, London with Jody Boehnert, Paul Micklethwaite and Jonathan Chapman, chaired by Guy Julier. Article on Occupy Design for desktop Magazine, Australia. Occupy Design RIMAD research talk, University of Bedfordshire, Luton. Occupy Design Camberwell College Of Art, University of the Arts, London. Design Practice For The Common Good Typolondon International Design Conference 2012 Social, Beyond Design Cosmetics (as part of Occupy Design). Institute Of Education, London. Debrand The City, Expose The 1% Occupy Design Talk at V&A as part of The London Design Festival, London. Part of the panel for this discussion with Brave New Alps, Fieldclub and the Design Disruption Group. Edinburgh College Of Art, Edinburgh, Scotland. What if… artists and designers redesigned economics? Capitalism isn’t working and the world is plummeting into a downward economic spiral, dragging down society and the environment with it. Prominent activists from the world of art, design and economics discuss the imperative of finding new way forwards, and ask what the role of the arts and design might be in a new economic revolution. Discussing the creative resistance: How is art used effectively in protest? A panel discussion event to coincide with the exhibition “Our Demonstration” with Leah Borromeo of The Space Hijackers, The Vacuum Cleaner and Dean Kenning. The Hub, Kings Cross, London. Design as Politics, Power and Shadow A discussion about how visual communicators deal with the political landscape within a shift in communication methods with Metahaven chaired by Rick Poyner, organised by RCA students as part of Red Tape. Royal College of Art, London. Signs of Revolt – Creative Resistance to a Commodified World talk at Tent City University, Occupy London Stock Exchange, St.Pauls, London. Signs of Revolt – Their Power and Our Power talk to students at Camberwell College of the Arts, University of the Arts, London. Presented paper Signs of Revolt, the Sign, the City and Revolution in the 21st Century at Social Change and Design Activism, Design History Society’s annual conference, Fundación Historia del Diseño/University of Barcelona. Because Youʼre Worth it-Creative Resistance to a Commodified World Talk presented at Galeria ZPAP, Warsaw, Poland. Supported by the British Council. Appeared on Graphic Design On The Radio on Resonance FM as part of discussion about the effects of cuts on Art and Design Edcuation. Tactical Media and Culture Jamming in the last ten years. Visual talk to Fine Art and Graphics students at Central St.Martins College, London. Visual talk at London College of Communication, London. Taipei Biennial, Taiwan Fine Arts Museum, Taiwan. London College of Communication, London. Other panelists included: Rick Poyner, Ken Garland. Visual talk Byam Shaw art school, London. Jamming their Culture, Creating our Own workshop, at the European Social Forum, London. Sign Wars: The Aesthetics of the Anti-Capitalist Movement paper given at Imaging Social Movements conference, Edge Hill College, Lancashire. Visual talk to MA students, Chelsea College of Art and Design, London. Visual talk at Byam Shaw art school, London. Visual talk at Portsmouth University, Portsmouth. Stammheim day at the ICA, the Mall, London. Visual talk at Marxism 2002, London. Visual talk at Colombia University, New York. Visual talk at Austrian Cultural Institute, London. Panel guest, Kilroy BBC tv. Talk at ‘Baby’ Kiezergracht, Amsterdam, Netherlands.